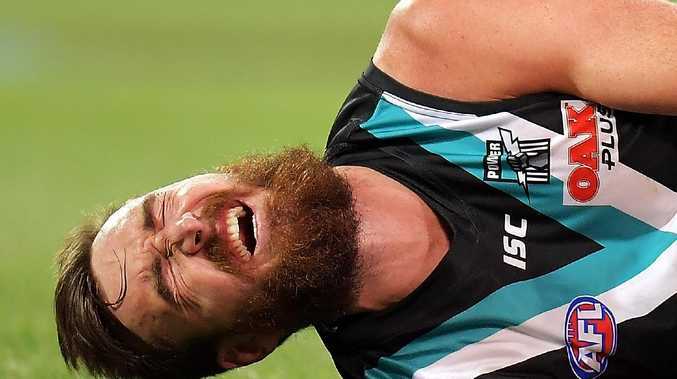 Key forward Charlie Dixon looms as Port Adelaide's biggest injury concern, with coach Ken Hinkley declaring his best player Robbie Gray will play in round one and that he is "hopeful'' captaincy candidate OIlie Wines will also front against Melbourne at the MCG on March 23. But Dixon has made a slower than expected recovery from a badly broken right leg and has only just begun running again this week - six months after landing heavily against premier West Coast at Adelaide Oval and fracturing his fibula. Dixon, who believes he is still a chance to play in round one despite admitting his injury is worse than first feared with him also separating the joints in his right ankle, is one of nine players already ruled out of the Power's intraclub match at Alberton Oval on Friday. Key man Gray (knee) and Wines (dislocated shoulder) will be sidelined, along with Hamish Hartlett, who is returning from a knee reconstruction but is on track to play in the premiership season opener. Of the lesser lights, second-year ruckman Sam Hayes remains in rehabilitation following a knee reconstruction, strong midfielder Joe Atley is recovering from minor left knee surgery following a training incident, last year's draftee Riley Grundy is out with an infection, clever forward Kane Farrell is having his training loads managed after a big pre-season and Trent McKenzie is on the comeback trail from off-season shoulder surgery. While No. 1 forward target Dixon's fitness is a major concern with the season fast approaching, Hinkley said Gray's knee injury - which has led to his late withdrawal from AFLX - is only minor and that Wines' has not been ruled out of round one following his injury in a water skiing accident. 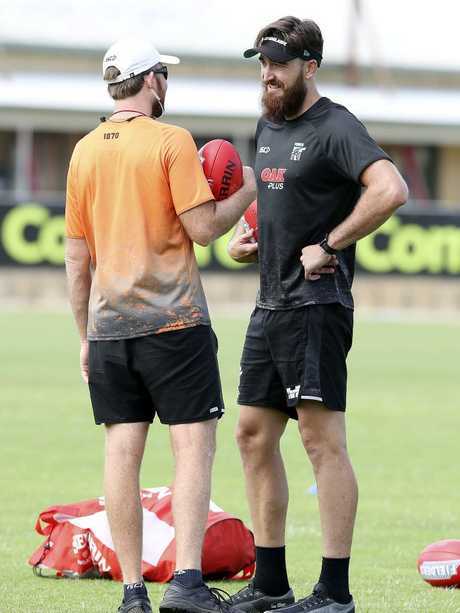 "Robbie's not too bad,'' Hinkley told SEN.
"He's had a well documented, really significant knee injury in the past (reconstruction) and it's the one that causes him a little bit of concern occasionally. "At this time of the year we certainly don't need him to be playing and doing stuff when he is at all sore. And while Wines had been expected to have a delayed start to the premiership season - and perhaps miss a month of football - Hinkley is refusing to draw a line through him just yet. "We're hopeful that he will be available for the start of the season but we're not going to push to rush him back because it is a long season,'' he said. Port's intraclub match will start at 5pm with entry by gold donation. Hinkley said the club would use the hit out to trial the new rules, which include the 6-6-6 starting positions and ability to run out of the goalsquare to play on from kick-ins. "The new rules are exciting and will really give you the ability to speed the game up,'' he said.